Sin Cara made his latest return to WWE TV tonight, upsetting Alberto Del Rio on RAW. Only it was clearly not our old friend Mistico, but someone else in the costume. Things are happening. The Sin Cara on Raw appeared to be Hunico, though they did not acknowledge any switch. Tonight’s Sin Cara and Hunico have the same tattoo. After this match, and probably after he had gotten a hundred replies on Twitter, Mistico I posted an update from Mexico City on FourSquare moments after the match ended. There’s a screenshot here in case it gets deleted, which it may – exposing a switch like that is enough to get someone fired or banished. Mistico I is either really dumb, really wants to be fired, or knows he’s already done in WWE and just doesn’t care. Maybe some combination of all of those. Mistico’s probably headed to AAA at some point in the future. It’s been the most likely next destination for years. It’s more likely Mistico would work the ex-WWE circuit of indy shows or go to Japan than go back to CMLL, best I can tell. It’s now more a matter of when Mistico’s able to go elsewhere. He may be hoping to get released immediately. He may have have a standard three year contract and would be free to move on in January/February. It’s possible he may be stuck in WWE longer – there was said to be a provision in Rey Misterio’s contract which allowed WWE to extend his contract because he missed so much time due to injury. Sin Cara missed nearly as much time if WWE wanted to make an issue out of it. It’d be just to bench him – barring an amazing reversal, Mistico’s not going to be in the Sin Cara costume again. This is coming to an end. WWE seemed to move on Monday and Mistico will do the same sometime in the near future. Non of this would’ve happened if Mistico were sent to FCW for some training. It is also he’s fault for not adapting to a new style of lucha. Well in theory Mistico wouldn’t have signed in the first place if they had made him go to NXT first. Pretty sure he was adamant about not going. I don’t know, this should help future international talent hoping to make it in WWE because they now know what NOT to do. @Wirehead: Mistico went to NXT (or as it was called at the time – FCW). He did not sign a contract and immediatly appear on TV doing his run-in vs Sheamus. He spent roughly 6 weeks there doing the usual training and getting used to the WWE ring/ropes. The reason he was rushed to the main WWE roster was the higher-ups in WWE needed to justify that contract. There were two options: Bring in opponents for him or keep him in developmental learning the style for as long as was needed (with him making big money on his guarantee). They made their decision – do neither. Everyone knew it was a bad idea. The rest is history. The other thing I’m concerned about is what the heck does the guy do for a gimmick? I’m assuming he can’t be called Mistico unless he goes back to CMLL. 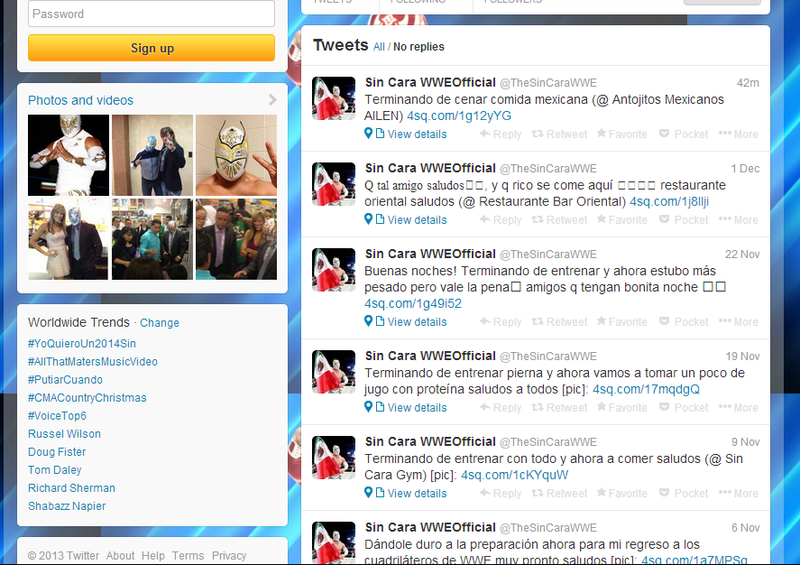 I would imagine Sin Cara is trademarked by the fed’, although I doubt he’d want to use that anyway. Crazy that he’ll have to use a third name in such a short amount of time. I believe Mistico trained in LA with WWE before his debut, and not FCW. That is what was being reported on the ‘net at the time of his signing. I’m not sure who he was training with, but that is where they filmed his vignettes with Averno and Alex Koslov. I could be wrong, but I don’t believe he went to FCW.